1 in 3 cats will experience kidney problems in their lifetimes. 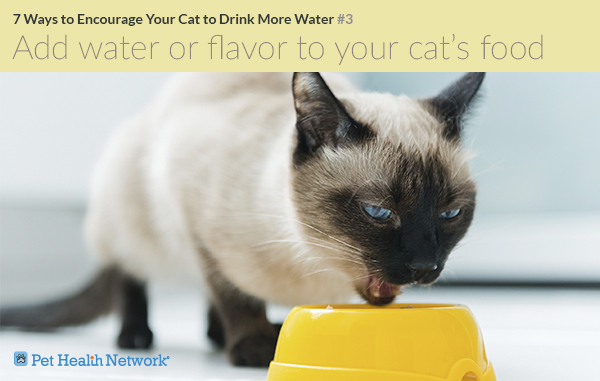 Many cat lovers have already had to deal with this issue at one time or another, and may already be aware that dehydration worsens kidney disease. 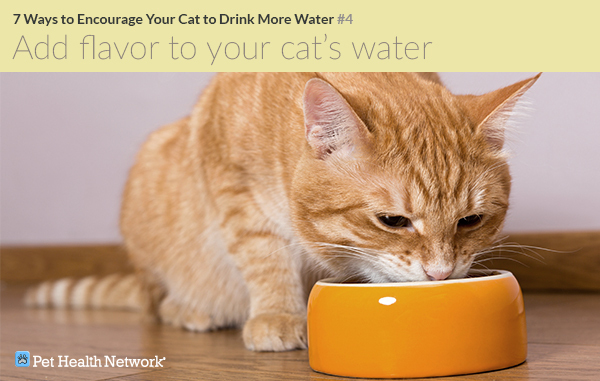 With that in mind, here are 7 great ways to encourage your cat to drink more water. 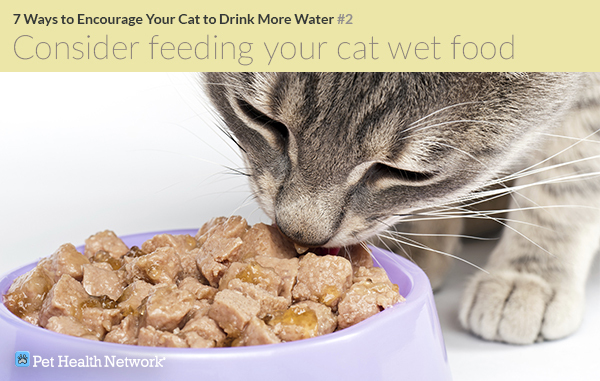 You should talk over any diet change with your veterinarian, but wet food can be a great way to introduce more liquid to your cat. It is always more important that a cat eats, than eats what we want, and it is surprising that not every cat likes wet food, especially as their only diet. So, keep your cat’s preferences in mind and make sure he eats enough of his new diet to maintain his energy level and weight. Click here for more, amazingly effective, feeding tips. Consider adding water or a low sodium chicken broth to canned food or get creative and discuss other flavor options with your veterinarian. You want to find something that’s healthy and appealing to your cat. Remember, each cat is an individual, and even the texture of food can make a difference. Consider adding low sodium tuna or clam juice ice cubes to your cat’s water (you may want to use a different tray than you use for your own cubes). The ice will not only keep the water cold longer, but can add a tasty flavor. Alternatively, you can give the cubes to your cat to play with. Keep in mind that your cat probably doesn’t want to share the dog’s giant bowl. 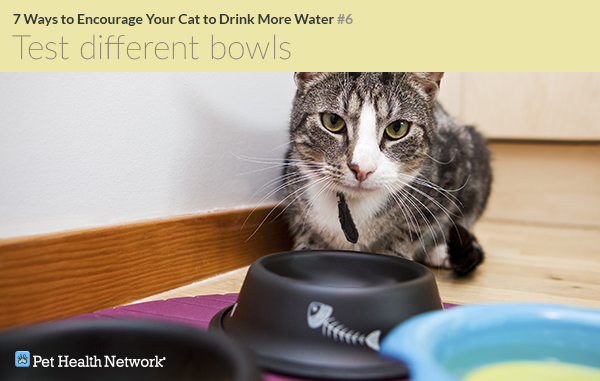 In fact, the only way you’ll know your cat’s preferences is to swap out different bowls at different times. Better yet, keep several bowls out at all times and see which one drains the fastest. Lastly, consider broadening your definition of “bowl.” Dr. Jane Robertson’s cat, for example, only likes to drink from a clear drinking glass. Click here to learn why small bowls are a great idea! 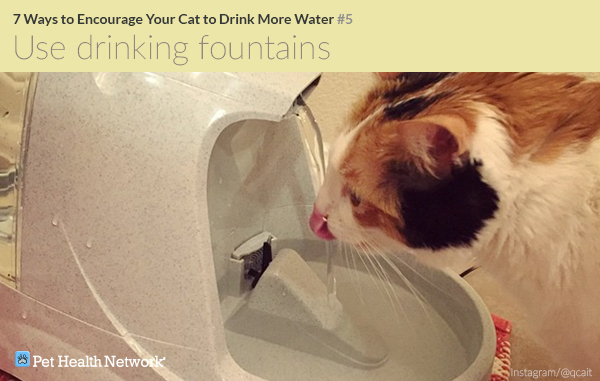 Many cats will embrace less conventional methods of getting water. 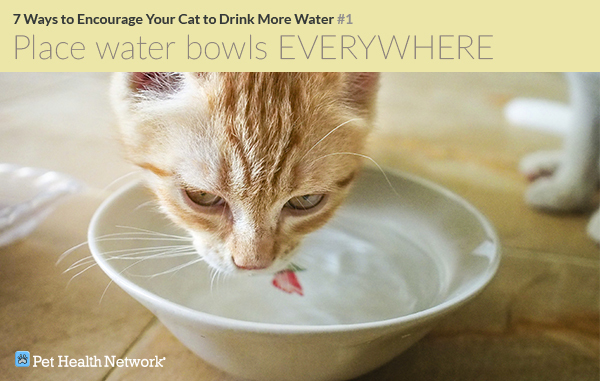 Many cats, for example, would rather drink from a leaky faucet than an open bowl. 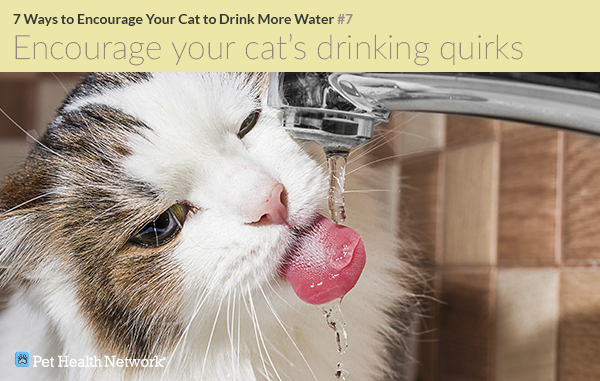 If you notice this behavior, by all means, let your cat have a few drips before turning off the faucet. Looking for more nutritional tips? Check out our nutritional section by clicking here.